Summer, I'm holding on for just a little longer okay? I always have this weird delusion that when summer hits the livin' will get easy. This may have been true in my youth, but it hasn't rung true for most of my 20s, and as I quickly approach 30, I have a feeling it won't happen there, either. Instead of beaches, hikes, and sleeping in, this summer is filled with driving to and from camps, arranging playdates, a heavier workload, studying, family health issues, my own health issues and weather too damn hot to turn on the oven. While being busy with a full life is awesome, unwinding and connecting is, too. Thankfully, we have had our moments of solitude, of lake-swimming and nature strolls, too. I'm just hoping that next year, finally, is the year we get a little more. Today's treat is bright and fun, just like summer. It's a cookie meets cake, thrown into hyperdrive. 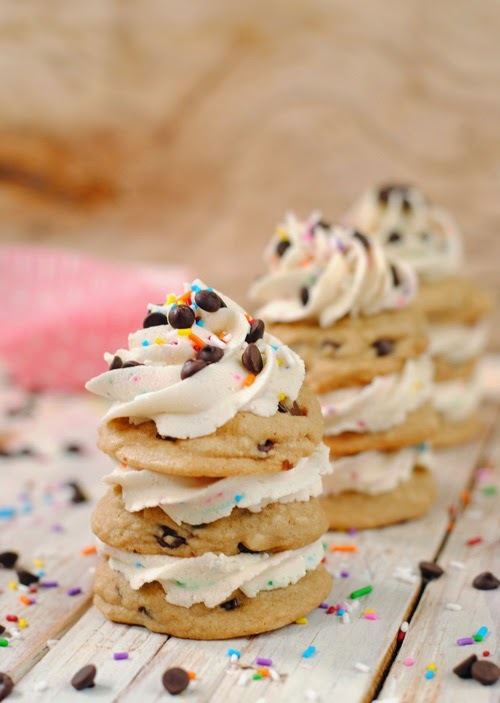 Because who doesn't love chocolate chip cookies and funfetti everything? We've got layered buttercream and cookies to create little cookie cakes that are perfect for picnics, potlucks, and birthdays. Stack and go, friends. And enjoy a little summer haze for me. Begin with the cookies. Cream the butter and sugars together, then beat in the egg, egg yolk, and vanilla. The mixture should be light and fluffy. Add the flour, baking soda, and salt, and mix until well combined. Stir in the chocolate chips. For best results, chill the dough for at least 1/2 an hour, but you can go ahead and bake right away if you're in a time crunch. When ready to bake, preheat the oven to 325F and scoop 1-2 tablespoons of the dough onto a lined baking tray. Bake for 8-12 minutes, until golden brown and the edges are set. Allow to cool on a wire rack. While cooling, make the icing. Beat the butter in bowl of a stand mixer, and gradually add the sifted icing sugar, 1/2 cup at a time, until desired consistency is reached. Beat in the vanilla. If things get too stiff too fast, just add a tablespoon of cream or milk at a time until it softens. Mix in the rainbow sprinkles. Once the cookies are cool and the icing is prepped, layer two to three cookies at a time with 1-2 tablespoons of icing. I find it easiest to pipe it in, put a spoon or spatula works well, too. The cookies stacks are best when left to sit for a couple of hours so everything softens together just a bit.